Personal injury, medical malpractice, domestic relations, condemnation, real estate, construction, contracts, corporate disputes, employment, professional liability, defamation, environmental issues, government issues, and trusts & estates. • Judge, Circuit Court of the 10th Judicial Circuit of Virginia, 2009-2016. • Judge, General District Court for the 10th Judicial District of Virginia, 1997-2009. • Highway Condemnation Counsel for the Virginia Department of Transportation, 1987-1997. • Private practice of law, Halifax County, 1987-1997. • Former Senior and Managing Attorney, Virginia Legal Aid Society. • Former Assistant Commonwealth’s Attorney, Halifax County. • Former Counsel, General Electric Company, Lynchburg. • Former Assistant Attorney General, Commonwealth of Virginia. 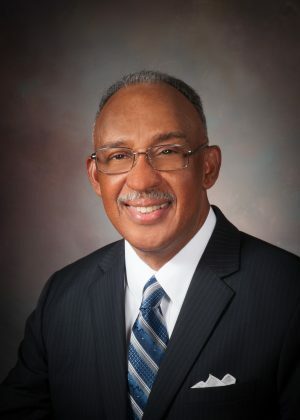 • President and Chairman of the Board, Halifax Regional Hospital. • Vice Rector and Member of the Board of Visitors, Virginia State University. • President, Mary M. Bethune Scholarship Foundation. • Member, Board of Advisors, Duke University Eye Center. • Recipient, Community Service and Scales of Justice Award. • Member, Access to Justice Commission. • Recipient, First Annual Joel C. Cunningham, Sr. Award. Award honors a lawyer in the 10th Judicial Circuit who performs exemplary work and leadership in providing access to justice for the poor. • Former Member, Commission on Professionalism, Virginia Bar Association. • Faculty Member, Harry L. Carrico Professionalism Course, Virginia State Bar. • Virginia State University, B.S.